In the last year or so I’ve fallen in love with Turkish spindles. I consider myself to be a hard-core spindler and work mostly on Houndesign Henry Dervish spindles. They are beautiful tools and at 35 – 40 grams, are of a good weight to make most kinds of yarn. And, they have a slender shaft that allows me to run it up (or down) my thigh and get into really high speed spindling fast. The Turkish spindles, while of a similar weight, are not fast. You can’t run them up or down your thigh, you have to flick them to put them into motion. So they are slower. This slowness has proven to be a good thing. The slowness coupled with the weight makes a different kind of yarn than what I was making on my Houndesign. The weight of the Jenkins stretches the fibre. The twist enters slower than it normally does, while the fibre is stretched. Once plied and washed, the fibres bounce back and the yarn is soft, lofty, and light. Here’s my first Jenkins – 50 grams. The turtle (that’s what the cop on a Turkish spindle is called) is blended Corriedale. As I was newly into Turkish spindle spinning, I was following what the spindlers on Instagram were doing to wind their turtles. “Over two, under one” around and around lining the strands up in a neat sequence. It makes for a very pretty turtle, especially when you use multi-coloured fibre like in the second photo – but it is time consuming. And this is my newest Jenkins – a Swan 34 grams. After moving away from winding on in a methodical way, I decided to revisit it to see if it makes a difference. Here it is with 43 grams of fibre on it, all carefully wound. But look what happened when I removed the arms and shaft. The last layer of wound fibre is peeling off. Not impressed at all. What I noticed in other instances of winding on this way was that the yarn came off in layers and I didn’t like that either. I am thinking that the turtle will be much larger because the yarn is not neatly wound. But at least it will stay in place. We shall see. 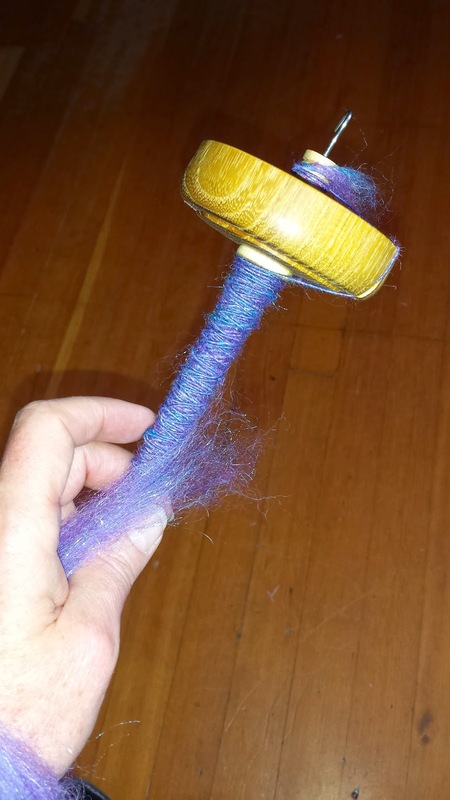 This entry was posted in drop spinning, handspun yarn, spindling, spinning and tagged Turkish spindles on March 25, 2016 by DianaTwiss. Last weekend I wrote about battling default yarn. This is what happens when you get really good at spinning and go into the “zone”. For the most part this kind of yarn is fine, but what happens when this is the only kind of yarn you can make? 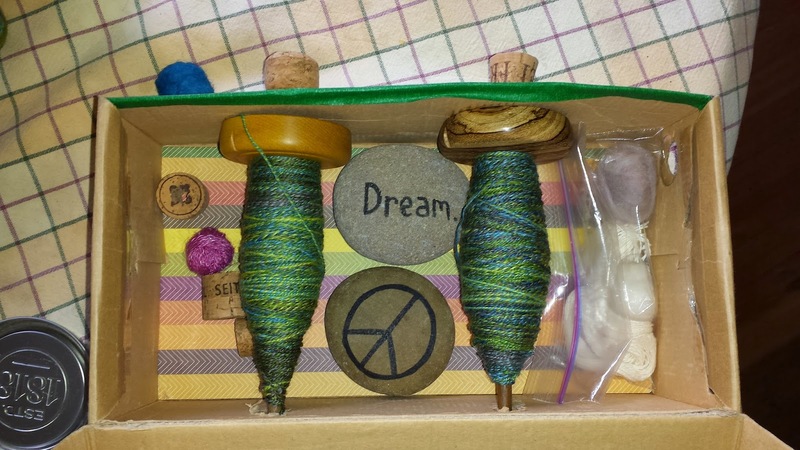 I want to have a wide repertoire of spinning techniques and finished yarn. So last weekend I tackled it. Below are the finished singles from all the batts that I showed in the last post. 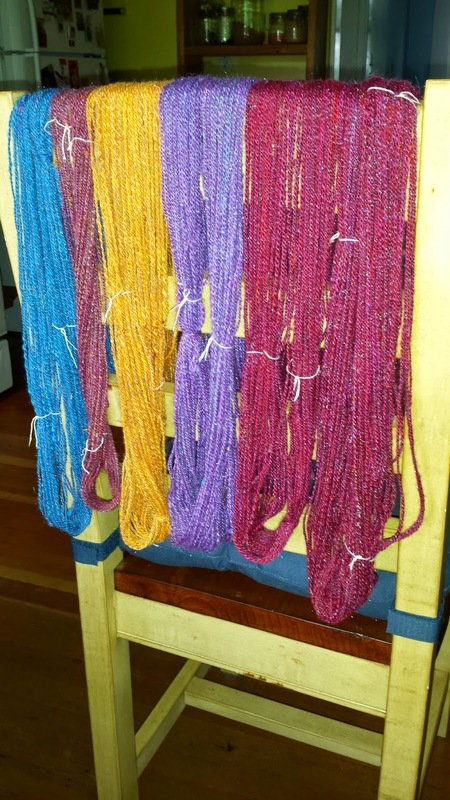 They were spun from batts which is different from the preparations I usually work with – and I spun as quickly as I could and didn’t overly fret about thin and thick spots. And here is the yarn, washed, thwacked and drying. It’s a total of 317 yards or 294 metres. The picture doesn’t really do it justice. The colours look much more solid and consistent than they actually are. 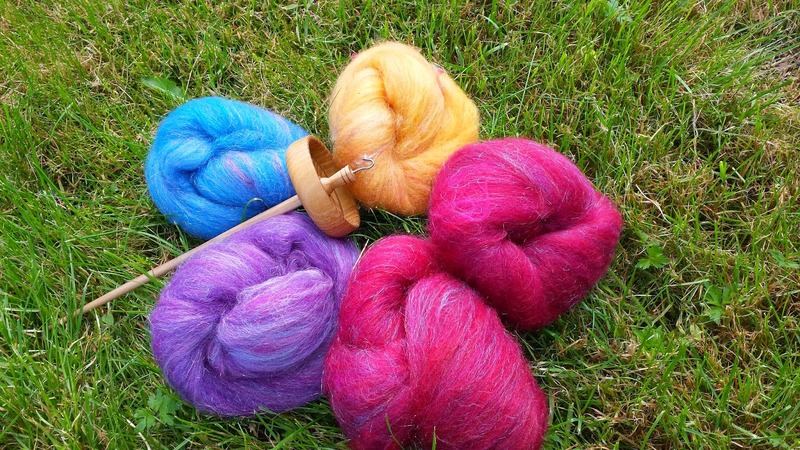 Each skein has about four colours of wool in it, including bits of silk and shiny Angelina. 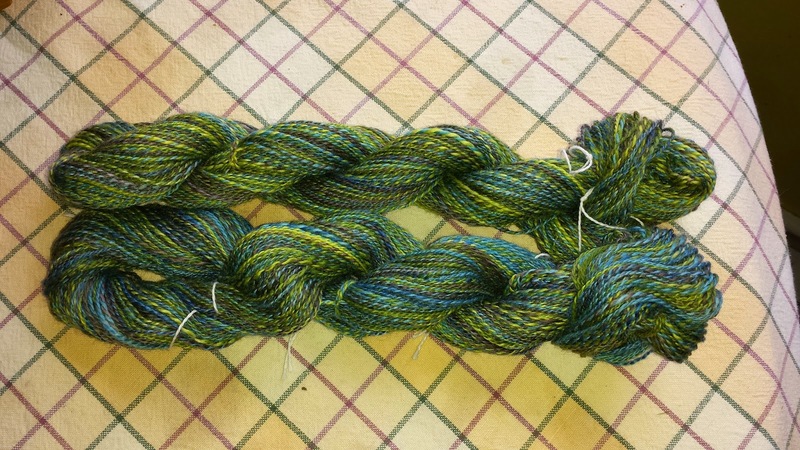 It’s a thicker weight than the yarn I usually produce, but it is still a bit too even for what I was aiming for. Back to the drawing board to really try to bust out of default yarn. This entry was posted in drop spinning on May 25, 2014 by DianaTwiss. 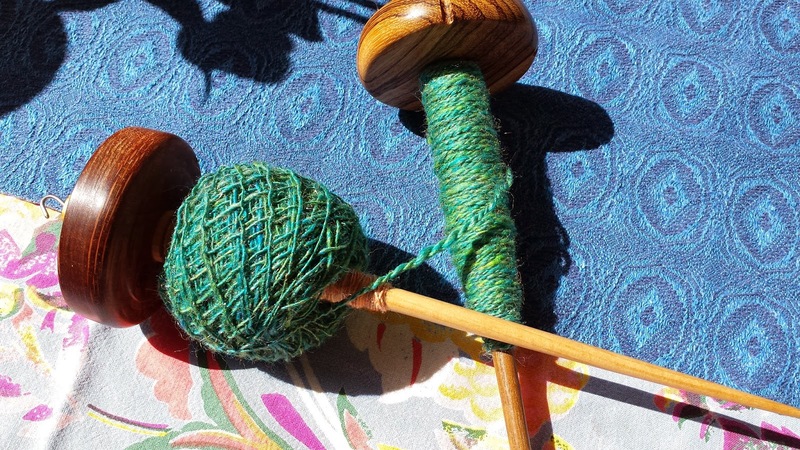 When you first learn to spin, your yarn is lumpy, bumpy and full of character. 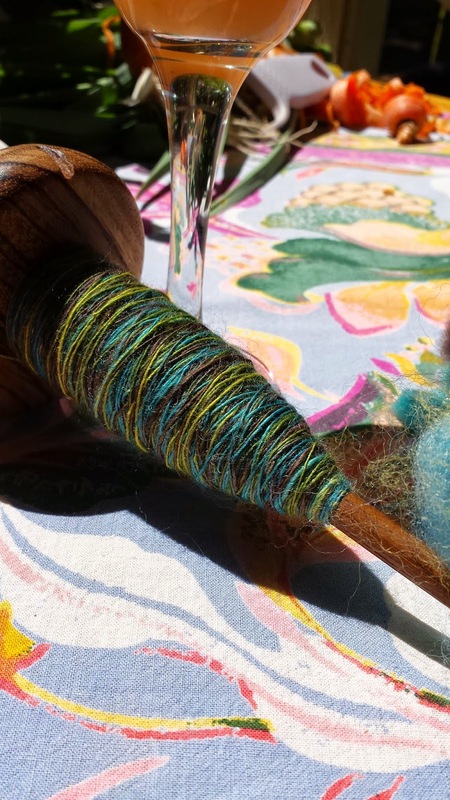 If you keep spinning, in a very short while you will be making even yarn, and as many of us have experienced, your yarn will get thin, thin, and thinner. In fact, it will take some effort to spin thicker yarn. 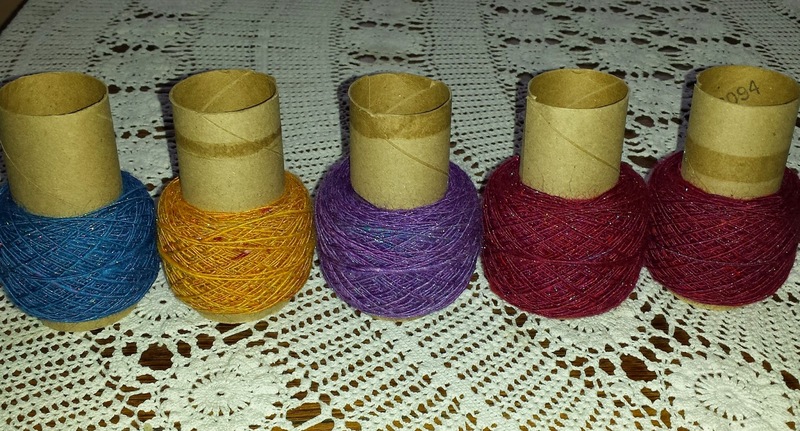 Many of us experienced spinners have noticed that we have a “default” yarn that we spin. That’s the yarn that we automatically make when sit at our wheels or pick up our spindles. Default yarn is not a bad thing, but it does mean that you are spinning the same yarn over and over again. 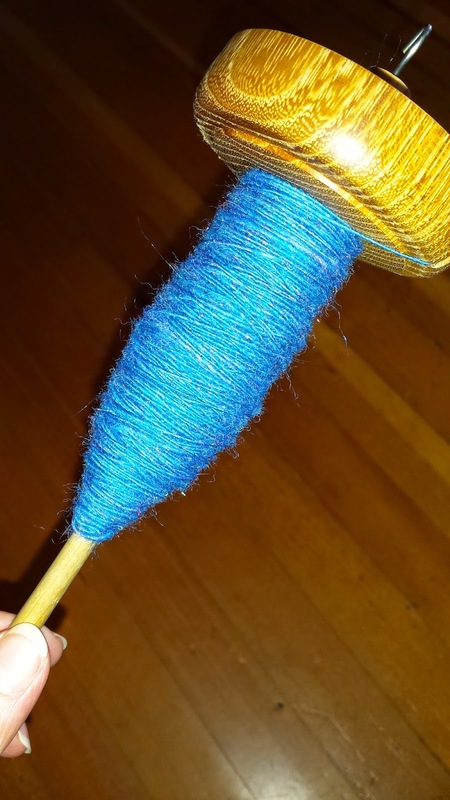 I have managed to bust the default yarn syndrome when spinning at my wheel. But I have recently noticed that my spindle yarn is starting to have that same look about it. 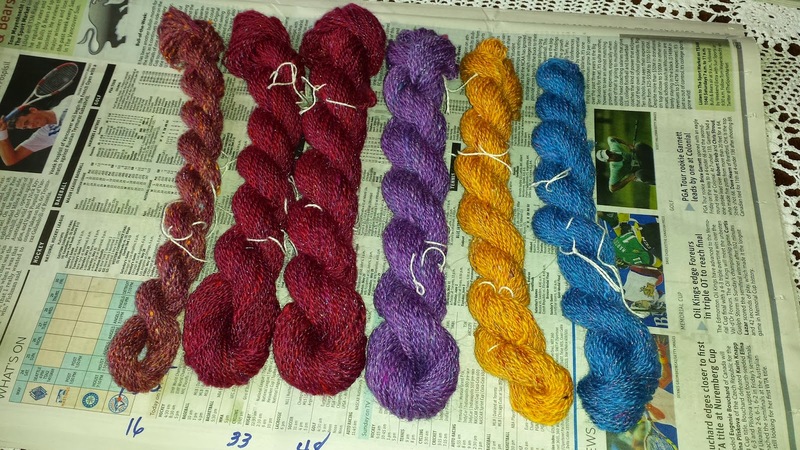 This weekend I decided to battle default yarn syndrome when spinning on my spindle. First thing I did was I got out fibre that I don’t normally work with in a preparation that I don’t normally use with my spindles. I usually spin up wonderfully prepared rovings from the Sweet Georgia Yarn fibre club. But the yarn I pulled out of my stash was a blend of corriedale, bits of silk and shiny lovely Angelina. I carded these five batts on a drum carder a few weekends ago when I was demonstrating at the Bradner Flower Show. To get out of the default zone, I decided to spin these up as quickly as possible, not worry about thick and thin bits, and try to spin a bit thicker than I normally do. Here’s the blue batt all spun up. And the yellow batt all done. And just at the beginning of the purple batt. I wind these off onto toilet paper rolls so I can have a centre pull ball for plying. Here’s what that looks like. The yarn on the centre pull ball is just resting in the spindle on the bottom to hold it in place for the photo shoot. To ply I hold the ball in my left hand with a couple of fingers inside it so I can control the yarn that is coming from the inside and around the outside. I let out a good arm’s length of both yarns and then spin it counter clockwise. 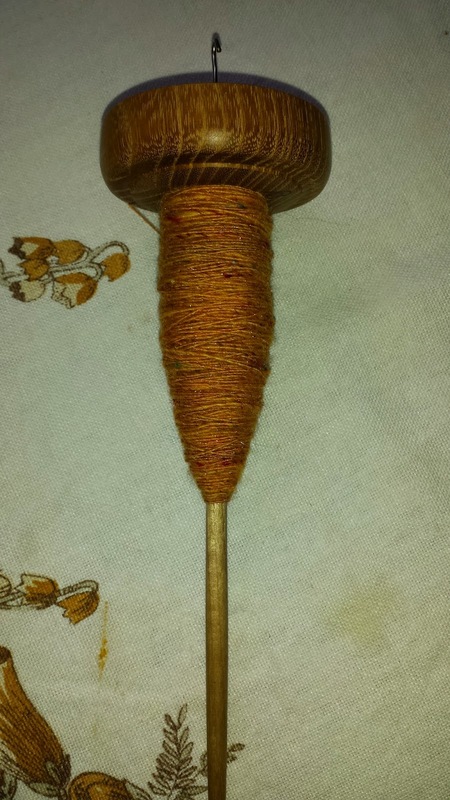 And then wind that onto the spindle. 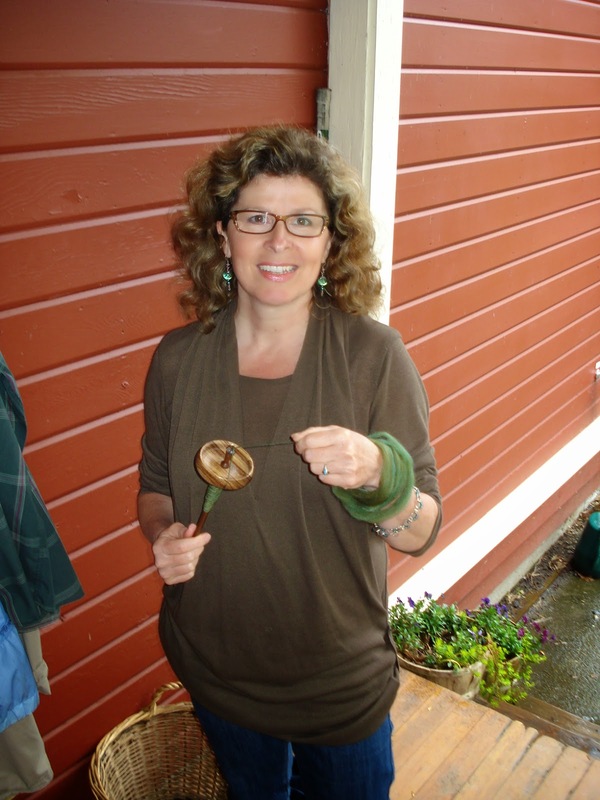 This green yarn was made the same weekend as the others, and it was the only one spun up that weekend. Will post the finished yarns soon. Gotta get back to the purple. This entry was posted in drop spinning on May 19, 2014 by DianaTwiss.